CLEVELAND – All season long Jose Ramirez has done it at the plate, and now with a birth in the postseason all but secured for the Cleveland Indians, it looks like Carlos Santana is joining him. The two Indians batters combined for seven hits, four doubles and two RBI Wednesday night as the Tribe took care of business yet again against the Kansas City Royals, topping the defending World Series Champs 4-3 at Progressive Field. The win puts the magic number down to five, as the Tigers and Twins were rained out Wednesday night in Minnesota. As it stands, if things go the Indians way on Thursday the team could celebrate their first division title possibly as early as Friday night at home against Chicago. “We know we are in a good spot but we are not looking ahead,” Indians winning pitcher Corey Kluber said after the win. Kluber did enough for his 18th win of the season, going 6.1 innings, allowing two runs on six hits with two walks and nine strikeouts. His ERA stands at 3.11 on the season. The 18 wins for Kluber ties a career-high in a season, and he’s won nine of his last 10 decisions at Progressive Field, posting an ERA in that time of 2.34. He’s also gone an impressive 9-1 since the All-Star break in 13 starts, second-best among pitchers with at least 10 starts. Only Jon Lester of the Cubs at 9-0 has been better. 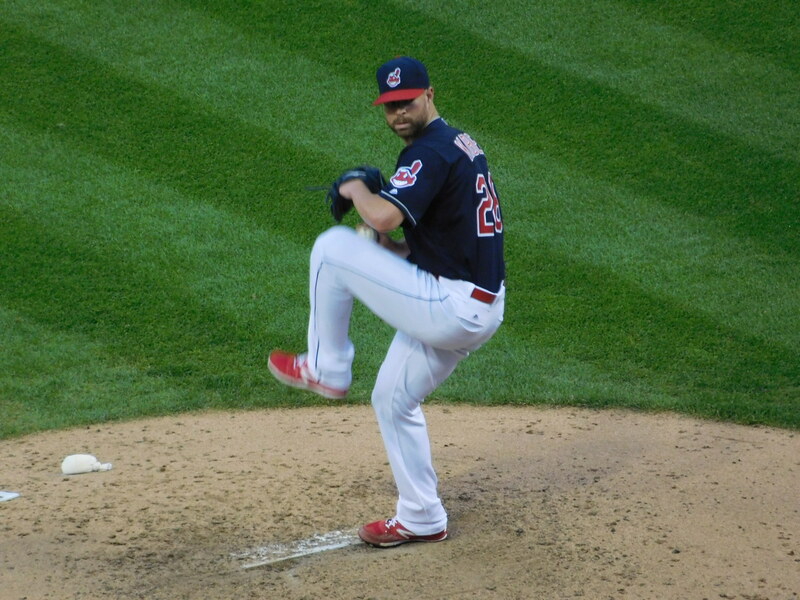 While Kluber provided the pitching, it was the bats of Santana and Ramirez that did a lot of the damage at the plate. Ramirez with three doubles now has 42 on the season, and is hitting .315. He drove in the go-ahead run with the game tied at two in the 5th inning that broke a 2-2 tie. After a season in which he hit .219 in 97 games in 2015, it’s hard to argue the fact against him being the MVP of the team making up for the absence of former All-Star Michael Brantley. With his outing tonight he became one of only five Indians players ever to record 10 homers, 40 doubles, and 20 stolen bases in a season. Santana at the top of the order went 4-for-5 with a double and a RBI. He’s hitting .251 on the season, but has been on fire this homestand, hitting .450 (9-for-20) with three RBI. The team is now 88-63, and the 25 games above .500 is the club’s new high-water mark for the 2016 season and highest mark since finishing the 2007 season at 30 games over .500 at 96-66. Thursday the team will get a look at Mike Clevinger, who at 2-2 will go up against Jason Vargas (0-0, 3.00) for the Royals.